Editor’s Note: This content is part of our CMX Fundamentals of Community Strategy online course. Learn more here. Thinking about launching a community program for your company? Great! Community represents a massive opportunity. It’s the future of how businesses will function, bringing people together online and offline, giving customers the power to contribute and working together to achieve your business’ mission. You may have seen this trend and thought, “we need a community too!” but you’re not sure where to start. Or maybe you’ve already launched a community, but found yourself a bit lost and in need of a clear process. How is your community going to create value for your company? Will members be motivated to participate? Who’s going to be responsible for it? What metrics are you tracking? If you aren’t confident about your answers to these questions, it’s time to step back and create a solid community strategy. I know, I’ve been there. I’ve been hired as a Community Manager by a team that had no idea what a Community Manager actually does. I launched a community, created content, hosted events… without having a clear picture of how it would add up into tangible returns. Because of that, we hit numerous dead ends and were left with a disorganized and chaotic approach to our community programming. This is all too common. It’s no wonder the primary reason branded communities fail is because of lack of internal support and resources. Without a clear strategy, sooner or later, you will likely hit the same dead ends. And, honestly, it is likely you will fail. You may lose time, money, energy, and countless other resources along the way. But have no fear! 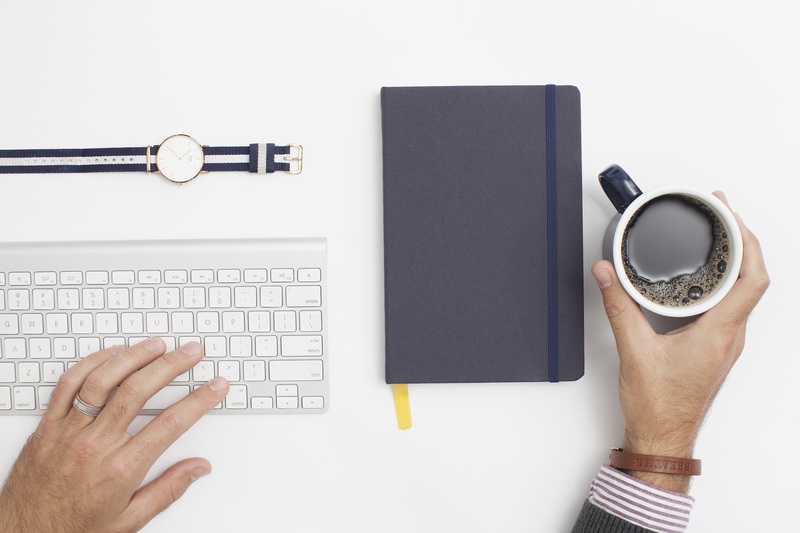 At CMX, we know that in order for you to thrive, you need to have a clear structure for your community strategy. That’s why, after researching hundreds of companies and how they build community, we’ve developed a canvas to help you move forward, armed with the answers you need. Looking for a Version You Can Fill Out? Get a free preview of the activity from our online course. Alignment is where you think high-level about why your community exists, what the goals are, who members are, and the culture you’ll create. Development is where you plan out how you will actually build and measure your community. Management is the infrastructure that creates an environment for your community team to succeed within your organization. Inside each of these levels are The 9 Fundamentals of Community Strategy. As you solidify your approach to each fundamental piece of the community puzzle, your overarching strategy becomes stronger. 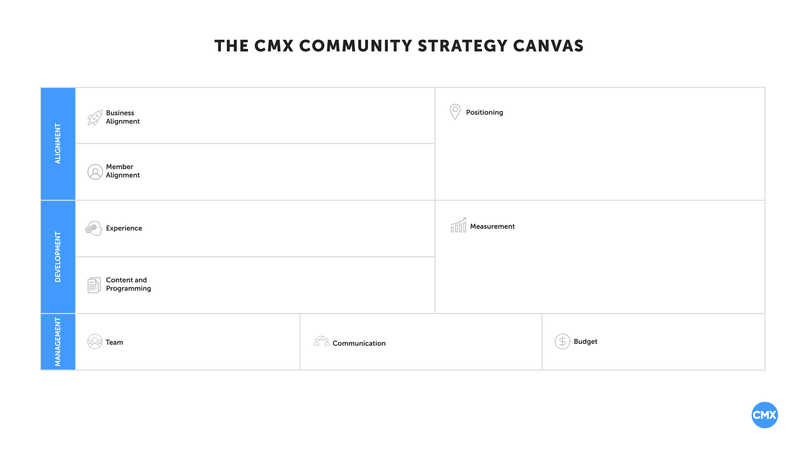 Let’s look at each individual fundamental of The CMX Community Strategy Canvas in a little more detail. Business alignment is the first fundamental of community strategy when we talk about branded communities. Why does this come before anything else? You’re building community for an organization, and that means you have to understand the goals of your organization and create clear value. You have to be able to answer the question: Why does community matter to this organization?If you don’t have business alignment, nothing else matters. How does community align with the mission, vision, and values of the organization? What value does the community bring to the business (using the SPACE model)? Where does community fit in the overall customer journey? The second fundamental of community strategy is member alignment. You can set all the business goals you want, but if you don’t solve an actual problem for people, they’re not going to be motivated to participate. This is where we do research to better understand our potential and current members, and put together a persona (or a few) to understand who our members are and what community can do for them. Like business alignment, without member alignment, nothing else matters. You have to solve a problem for your members or they will not participate. Who are your members? What are their demographics, personalities, identities? Why will they be motivated to participate? What are their needs, wants, challenges, or pain points? Just like a product is “positioned in the market”, so is your community. Once you have clarity on the first two fundamentals, you can put together your community positioning. You’ll define why your community exists and the unique value it offers. Positioning will serve as the guide rail for everything you create in your community. What are the vision, mission, and values of our community? These must align with the vision, mission, and values of the organization as a whole. What is the voice of our community? What is our community value proposition? In the alignment level of your community strategy, it’s all about the 4 V’s: Vision, Values, Voice, and Value Proposition. Experience is the first fundamental at the development level of community strategy. For this fundamental, we determine how we’ll actually organize our members and create an engaged community. In order to plan out what content and programming you’ll use to create your community, you first need to define the experience that members will go through. Creating the community experience allows us to step out of our builder shoes and put ourselves in the shoes of the community member. What will they experience as they become engaged members of our community? Members can also fall into an inactive state. We map out these levels and aim to understand what the community member experience looks like at each one, using the CMX Community Engagement Cycle as our guide. Once we know what the member experience looks like, we can start planning out the content and programming that we’ll create in order to fuel that experience. This way, we know why we create every blog post, host every event, start every conversation…we’re working to fuel the experience we defined in the last fundamental of community strategy. What content and programming can we create to fuel the community engagement cycle for our members? What is our content governance plan? Who is responsible for each kind of content or program, what is the goal and what are the measures of success? How are we organizing all of our content and programming into a content calendar that keeps our team, and other teams on the same page? Note: For the “Experience” and “Content and Programming” sections, we use the Community Engagement Planner to lay out the experience, and how we’ll fuel that experience. Learn more about the Community Engagement Cycle and Planner here. Now we know what our members will do and what we’re creating to fuel that experience. We’re not done with our development plan though! We need to track our work to ensure that we’re focusing on the right things, and that we’re actually driving the value we promised to our companies. We recently released a research report that will give you high-level insights on how the entire industry is doing this, but you need to apply this to your own situation. In measurement, we look at three areas: Content and Programming, Community Engagement and Business Objectives. What are the goals we’ve set that data will help us track? How are we keeping track of our content and programming so we can identify what’s working and do more of it? Is the work we’re doing resulting in an engaged community? How do we define the difference levels of engagement? What is the value we expect from our community (again, using the SPACE model) and are our members taking the actions needed to create that value? What are our KPIs and what dashboards need to be set up to organize all of the data we’re collecting? Now we’ve planned out our community alignment and development levels. Let’s make sure that the management pieces are in place to set our team up for success. For this fundamental, we aim to define how our community team is structured. We also identify the other teams that will impact or be impacted by the community. This allows us to figure out where community fits in our organization, if community fits under an existing department or stands alone. What other teams are involved in the community strategy? What do you need from other teams and what do they need from you? Now that you’ve defined the other teams involved in the community, you need to plan out how you will communicate with each other. Communication creates internal clarity, trust, and helps people make better decisions when they have access to the right information at the right time. When communication falls apart, people start questioning your work and whether or not it’s creating any value. Communication can take place in many channels, like regular reports, meetings, task management tools, email, or Slack. What information and data do other teams need from you? What info and data do you need from them? How often is that information needed? What channels will be used to convey that information? And finally, we have budget as our final community fundamental. Not all community professionals will be responsible for managing a budget, but all of them should have a clear idea of how much they’re spending and bringing in. Everything costs money. The tools you use, the events you host, even your time has a dollar value when you break down your annual salary. The more community professionals can think in terms of dollars, the easier it will be for them to have conversations around value and ROI. And it will keep them accountable to creating more of that value. What is the annual budget for community? How much does all of the technology (community platforms, emails, project management, etc) cost? How much does the team (employees, contractors, professional development) cost? How much does the content and programming we create for our community (events, experiences, swag, etc.) cost? How are we tracking our monthly spend to ensure we’re staying within budget? 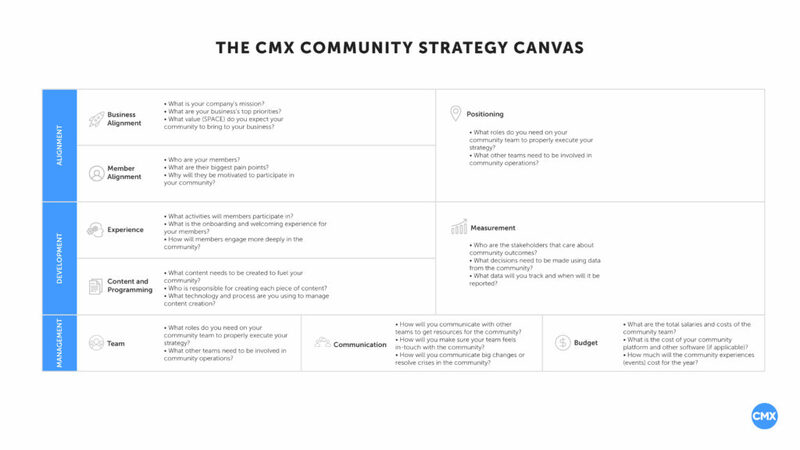 If you can thoughtfully answer all these questions and fill out all 9 fundamentals of the CMX Community Strategy Canvas, you will have a well-rounded plan for building community in your organization. We use this canvas internally every time we launch a new community event or experience. We use it to guide the content and programming we create. We use it for everything. We recommend coming back to this canvas regularly. Our training students and workshop clients are taught to come back to this regularly to ensure they’re thinking holistically about their community strategy. Things change too. Sometimes your business goals change, member needs change, budget and team changes… any time there’s a big change, you can come back to this canvas to see how that change impacts the other pieces of your strategy. All nine fundamentals are interconnected. If one thing changes, it’s probable that everything else needs to change as well. For your convenience, below you’ll find a canvas with question prompts filled into each section so you can fill out the blank version with some guidance. We hope this helps you gain more clarity and confidence in your work building community. If you want to become fully trained in each of these areas, the CMX Training Program is for you.